Cathy and her seven children prayed for safety in an underground shelter as a deadly EF-4 tornado ravaged the town of Little Axe, Oklahoma on May 19th, 2013. The family survived the storm, but was left homeless by it’s destructive wrath. 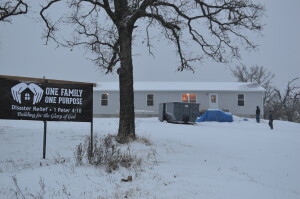 ONE FAMILY ONE PURPOSE mobilized a diverse group of willing volunteers from five different states to construct a beautiful new home for the Talbotts. Contact us today to find out how you can be part of our next rebuilding project!